This week was full of some creepy crawly learning fun. I am linking up with Doodle Bugs Teaching for her Five for Friday linky. First up, my blog has had a wonderful update from the talented and patient Megan @A Bird in Hand Designs. I did some serious shopping at the TPT sale on Tuesday.....and again on Wednesday. Plus I got two gift certificates from TPT to giveaway. I added 2 more gift certificates cause I think teachers deserve a treat and if you are anything like me you have already found other things you NEED to buy!! You can enter the giveaway here, it closes in a few hours. and used the fabulous free activities from Ideas by Jivey to go along with this mentor text. She has a freebie mentor sentence unit and a better than basal unit to go with this story. We read the story (and laughed and giggled and talked). The next day we looked at the mentor sentence. We make a group anchor chart showing what we notice about the sentence. We always start with how we know it is a sentence. I number what they identify then label it underneath. After we identified the comma (nope, not a comma), that thing up there....yes an apostrophe!! We also picked out two things we are working on...compound words and fancy words. On Thursday we worked on revising the sentence. Our focus is on using fancy words. So together we picked out words we could fancify. Here is our thinking. We also read all about earthworms using the passage from this pack. 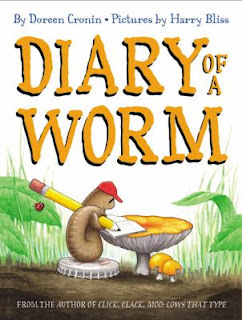 We made connections between this non-fiction text and Diary of a Worm. We picked out information that was in both texts, looked at how they are the same and different. This led us to researching an insect of our very own to write a Diary of a....book. My students are loving math and literacy centres. What they are loving most is telling me that they are finished and asking if they can use my tablet to take a picture of their work. I accidentally used this technique to reward a student for some great on-task work and to buy me a few minutes of time working with a few students. Now, picture taking is all the rage. It is kinda funny watching them frame their shot....for like 2 minutes before deciding they have got the perfect shot. So now I am constantly going through the camera files and deleting 15 pictures of word puzzles and math towers!! This activity is from Molly's Whoa Domino Long Vowel Pack. Lastly we made these adorable firefly Mother's Day crafts. We got the idea from this pin on Pinterest (where else!!). We used clipart from Krista Walden, blue cardstock, yellow copy paper, ribbon, a little bit of yellow paint and sparkles. They turned out adorable and considering that we were reading about fireflies today and how to let our light shine they were the perfect tie in!! Your blog looks great! I'm itching for a makeover. Love the Diary of a Worm activities...one of my favorites! 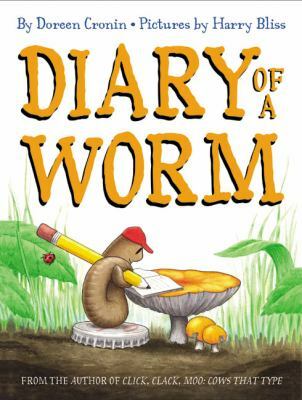 I love the Diary of a Worm activity! I will have to try this.